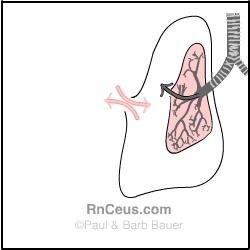 Pneumothorax: Air in the pleural space causes partial or complete lung collapse. Normally, the pleural space is under negative pressure; when air enters, the negative pressure is neutralized, and the lung collapses. Pneumothorax can be caused by trauma, causing air to enter through an opening in the chest wall, or may be spontaneous, causing air to enter the pleural space through a rupture in the lung wall. Tension pneumothorax occurs when air trapped in the pleural space increases, compressing the lung and shifting the mediastinum to the unaffected side. tracheal shift to the unaffected side of the chest.